Beach dunes are a feature of the Northern Beaches, particularly along the peninsula. Our beaches and their backdrop dunes, so familiar, are only about 6000 years old, forming as the sea rose after the last ice age. Until the 1970s dunes were regarded as a good source of sand, to be removed. The remaining land would then be levelled and turned to what was seen as a better use, such as land to be developed, parking, a road. 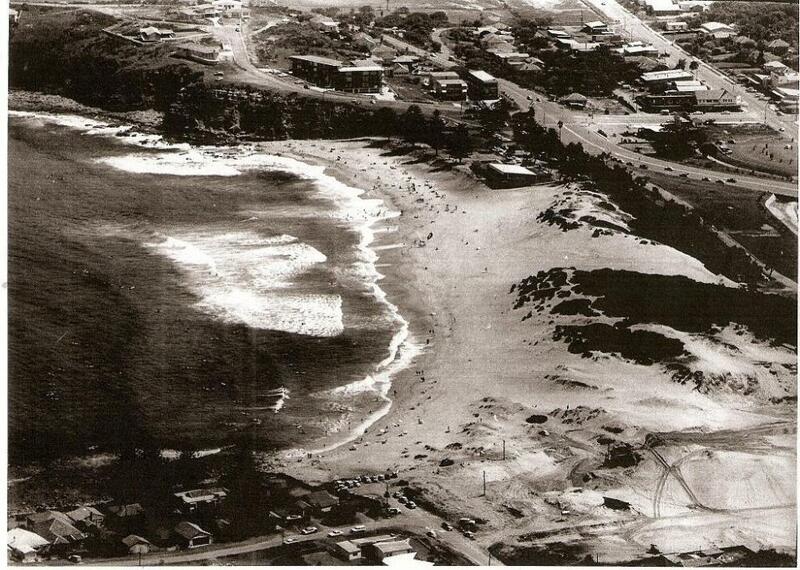 Imagine Bondi Beach, before the concreting and building happened! We can see how at Collaroy, with the benefit of hindsight and experience, this was not a good decision. This beach is one of the most affected by storm damage on the NSW coast. The sea often threatens houses built where the dunes used to be, and also Pittwater Road. Beaches backed by dunes can be resilient in what is a dynamic landscape. Vegetated dunes capture windblown sand, and surrender it in big storms, as the sea and wind claim it back to the beach. An active beach zone should be left undeveloped allowing sand to come and go with winds and tides. Bushcare volunteers celebrate the special vegetation that keeps our dunes stable and provides habitat for local fauna, specially small birds which use the dense native vegetation to feed and escape the bully birds such as Noisy Miners and Currawongs. On Mona Vale Dunes we have nesting Willie Wagtails and Eastern Whipbirds and have been visited by Yellow-tailed Black Cockatoos and Brown Quail. However weeds such as Asparagus Fern, Morning Glory, Lantana and Turkey Rhubarb have to be controlled to protect native dune vegetation. 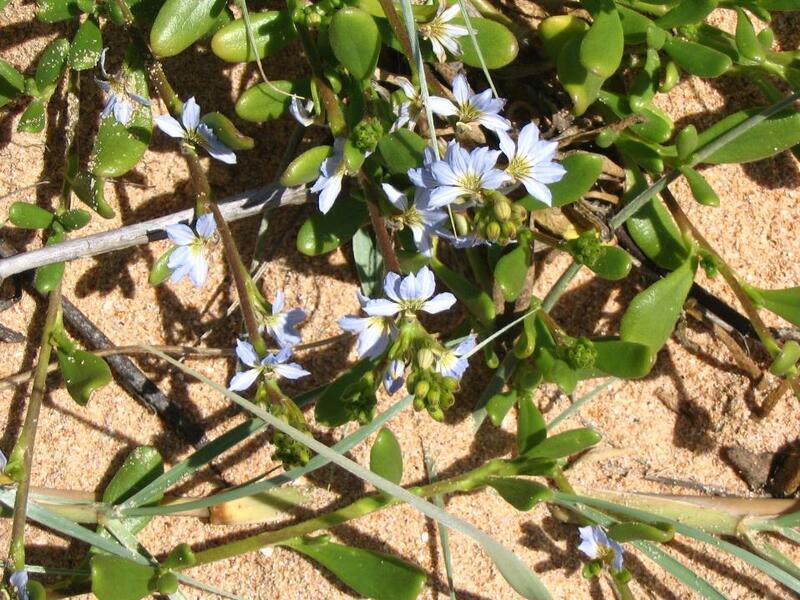 Volunteer bushcarers meet at Mona Vale Dunes on the second Saturday and third Thursday of each month. Some people go both days. At Avalon Dunes the first Sunday of each month is the work morning. Work starts usually at 8.30 and goes for 3 hours, including morning tea. Northern Beaches Council provides a supervisor to guide work at Mona Vale and volunteers supervise at Avalon Dunes.Both groups are covered by NB Council insurance for volunteers. Council bush regeneration contractors work on both dunes but need our help as their hours are limited. Have a look at the Facebook pages for more information and to keep in touch. Facebook page for Avalon Dunes Bushcare where you can keep up to date with progress and find out how to get involved. Volunteer bushcarers meet at Mona Vale Dunes on the second Saturday and third Thursday of each month. Some people go both days. At Avalon Dunes the first Sunday of each month is the work morning. After a long break, we'll be back on Sunday April 7. NB Council has changed management so that destructive camps are quickly cleared away and better weed control is happening - we're encouraged! We volunteers need some help, so why not join us at 8.30near the Montessori School. We finish at 11.30, but even half an hour of your help would be great. Wear long pants, long sleeves and hat. BYO Gloves. We bring tools and morning tea. Here is Mona Vale Dunes bushcare group at work. To suit most of us, we meet on two days of the month, so people come on either the second Saturday morning and the third Thursday - sometimes both! With a view like this, you can see why we love this place. Our morning teas are legendary, by the way. This photo may be from the 1970s and shows the dunes dangerously exposed to wind erosion, with not even today's dense weeds to stabilise it. Buildings on left are at end of Golf Ave.
View over dunes in 1969 from balcony at beach end of Golf Ave. We are lucky the destruction stopped when it did.We need our coastal dunes well vegetated and stabilised. Danina with her Asparagus Fern crown. Probably our worst weed, it's on Australia's list of Weeds of National Significance (WoNS). We can see why. A great feeling when you finally get out that crown. The white water tubers are only for water storage and can stay behind. Mona Vale Dunes - birds' eye view. Golf Avenue is our usual entry point, at top right of image. Our Profile picture is Beach Correa, Correa alba. This lovely little shrub flowers for most of the year, happy in wind and salty spray, a great dune stabiliser. 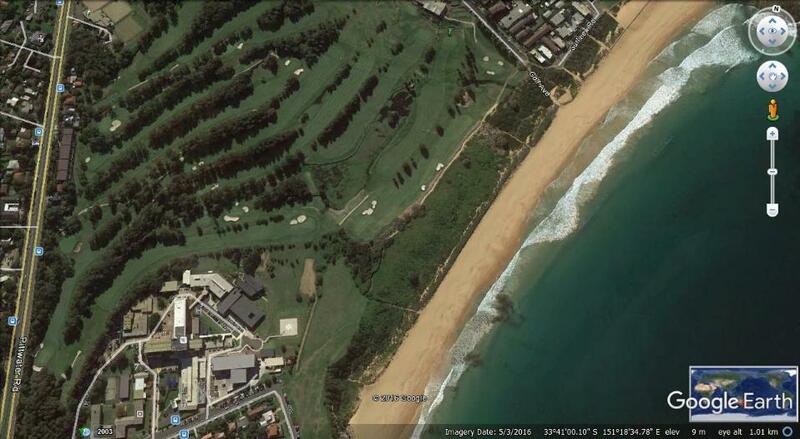 Mona Vale Dunes covers over 8 ha of our Sydney Northern Beaches coastline. The dunes and bushland have been nearly lost in the past to weeds like lantana and asparagus fern, and to sand removal. Much remains under dense weed, but with steady weeding and some planting of tubestock native plants, the northern area is recovering, and is a home for birds and other animals. Circus comes to Avalon. 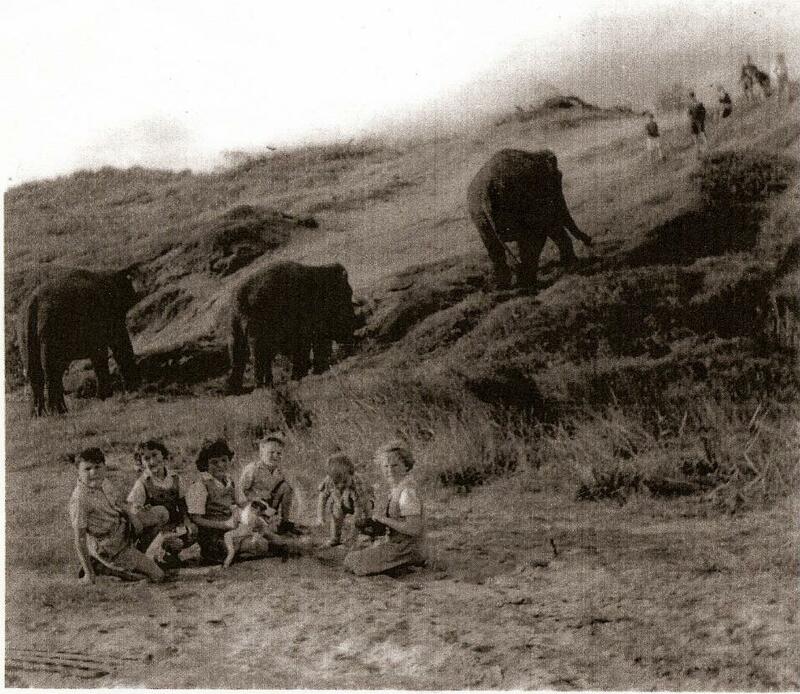 Elephants graze in the dunes in the 1960s. Poor dunes! No wonder the sand began to blow. For most of the late 1960s, commercial interests had been removing tons of sand from the northern dune, which included a huge spur buttressing this dune. Repeated requests from the Trust for a court injunction from Warringah Shire Council to stop this destructive activity were constantly ignored. The Avalon Preservation Trust ( now the Avalon Preservation Association) sent a telegram to the Minister for Local Government requesting cessation of the work and was advised that the State Planning were seeking to acquire the land for recreation purposes. The Trust was also informed that the council had the situation in hand. In truth neither had the situation in hand at all, so some members of the Trust took it upon themselves to stage a sit-in and create a vehicular barricade to stop the trucks from accessing the sand-loading equipment. Apparently this had the desired effect and a further injunction was successful. How much sand would have been left had the Trust members not brought about this action? 1964 - sand is being removed, dunes disappearing. Thank goodness local heroines stopped this! Our dunes would have gone to building sites.. The corner of Tasman Road and Marine Parade Avalon during the sanding mining. ‘The Avalon News’ article on same - photo by John Stone - six cars were parked along the front of where the photographer has stood to take this photo - this stopped access to the site by the sand miners. In 1989 volunteer works commenced under the Friends of Avalon Dunes Dune-Care Group to remove Bitou - this now covered 80% of the dunes. In a 2013 interview with Marita Macrae, who had just received the Ruth Readford Award for Lifetime Achievement*, Marita shared an insight into the beginnings of this group. Avalon Dunes - weeding with a view in 2013 - Weeding Spinifex grass - not much else grows in this windy salty place. *The Ruth Readford Award for Lifetime Achievement honours an individual who has dedicated significant energies, time and commitment to improving planning and/or management of the NSW coast. The Selection Criteria is described as: Positive impact of actions of individual either through employment or volunteer effort; length of time involved in coastal issues; and recognition by the broader community of individual’s contribution to coastal management. Scaevola calendulacea - a tough dune plant that loves the sun and doesn't mind some salt spray.